The Virtual Reality Industry Report includes everything you need to know about hardware unit forecasts, market revenue forecasts, industry & technology analysis, and other special topics for industry executives. Each Greenlight Insights report offers proprietary insights provided by our category focus, mosaic approach, and rigorous research methods. Rather than rely on biased opinions and secondary sources, we let our data tell the story. 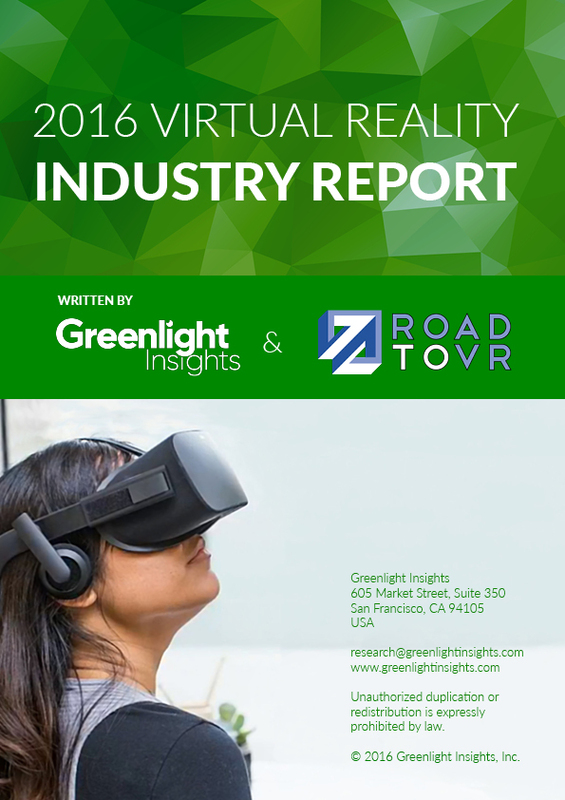 Since June 2015, Greenlight Insights has published the annual Virtual Reality Industry Report with the editorial contributions of the industry’s leading media publishers. This year, the Industry Report is written with RoadToVR, the world’s largest independent news publication dedicated to the consumer virtual reality industry. We keep tabs on every venture funding deal so you don’t have to. Our comprehensive VR/AR Funding Database product can help you identify potential targets for acquisition or business development, assess competitors, and develop management reports and analyses on virtual reality. Learn more about the VR/AR Funding Database. Plus, subscribers receive PDF copies of reports covering industry trends, access to Global Forecast Service and Proprietary Databases, and full-access to our senior analysts.